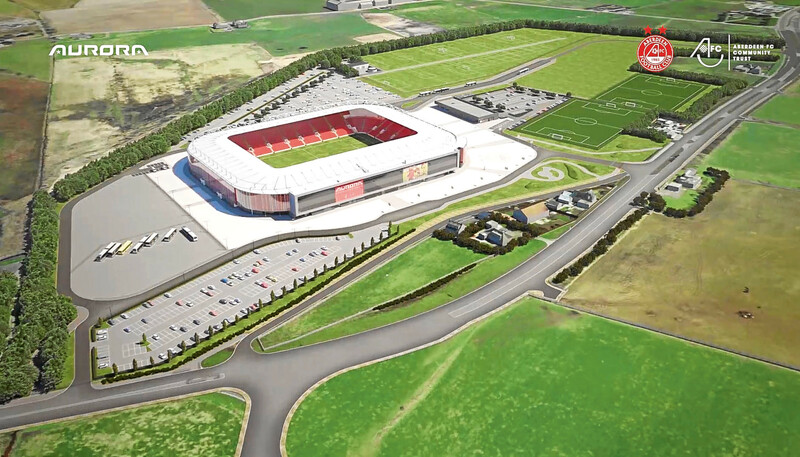 The long road to a new stadium and training facilities for Aberdeen Football Club has had its fair share of twists and turns. AFC has been seeking a solution to the challenges of the outdated Pittodrie Stadium and lack of training facilities for nearly 20 years. With potential locations at Bellfield and Loirston falling through, the club seized the opportunity at Kingsford on the outskirts of the city. Fans also backed the choice – a survey revealed that 86% were in favour of this location. AFC chairman Stewart Milne said: “The ambition for Kingsford is to deliver a dynamic, inspirational and inclusive football and community facility. It has been estimated that the Kingsford development will give a multimillion pound boost to the area every year. Analysis conducted by Aberdeen and Grampian Chamber of Commerce for the club states the total economic contribution could be £8.535million annually. That is the equivalent of 346 full-time additional jobs, as well as 400-plus people employed during construction. The project represents a £50million private investment, but not everyone locally was happy with the proposal. A protest group who attempted to block the construction of the stadium finally admitted defeat last month. 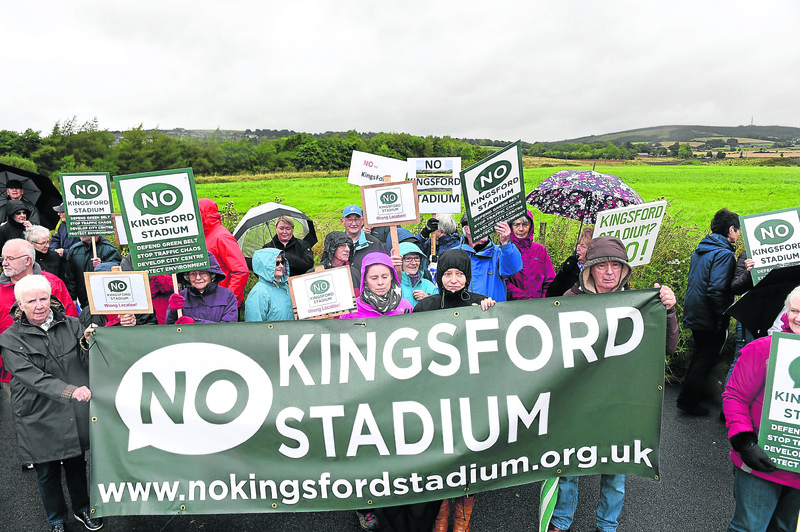 No Kingsford Stadium had launched a legal challenge against the complex, claiming Aberdeen City Council broke planning rules when granting it permission. The case was heard by Lord Tyre at the Court of Session in Edinburgh in February, but was dismissed on all counts. The way is now clear for AFC to clear the conditions attached to the planning consent and progress with the next phase. The development at Kingsford has been split into two phases. Phase one work started last spring. The overall investment in phase one was initially around £10.5million, but this rose to £11.5million when the club confirmed it was to upgrade the specification for the 3G pitches. Mr Edgar added: “We are committed to engaging local firms in the construction of the development in order to keep the spend within the region, boosting the economy and creating jobs. McIntosh Plant Hire was appointed last spring to carry out the earthworks and ground remediation which are now complete. The principal contractor, Morrison Construction, was announced towards the end of last year and has, in turn, appointed all the sub-contractors. This included William Donald for civil engineering, Hunter Construction to deliver the 3G pitches along with specialist company, Greentech, who will create the professional training pitches and Hutcheon Services who will be in charge of the design and install all mechanical, plumbing and electrical services. The club is firmly on track to have the training facilities ready this summer. The focus is now turning to phase two – the stadium and associated infrastructure. Mr Edgar said that the club is working closely with Aberdeen City Council and Aberdeenshire Council on “purifying” the conditions. “We fully recognise the concerns among local residents and fans about parking and getting to and from the stadium safely. “Crowds, traffic and parking on matchdays, around 25 per year, will be strictly policed and carefully managed. “Efficient, planned traffic management and shuttle buses will make the journey from the city centre quick and easy. The club will shortly be going out to consultation with fans on the design and layout of the stadium. Mr Milne explained: “Our purpose-built stadium will be more comfortable and warmer, with a much better matchday experience. “The atmosphere, or lack of it, at Pittodrie is a common criticism from fans and we will be asking them for their views on dramatically improving this in the new stadium. “We’ll be listening carefully to our fans’ ideas on what they want to see inside the stadium and speaking to the local community about how we can meet their requirements within the available space. “We’re open to ideas from an AFC heritage museum to flexible space within a concourse for community activities and entertainment before and after matches. Halliday Fraser Munro is the architect for the stadium and the programme is to carry out the consultation by September 2019 with a view to having detailed plans by January 2020 for completion of the stadium in time for the 2022-23 season. The challenge of raising the remaining £40million for phase two may appear a herculean hurdle, but the chairman remains confident that it is achievable. “Kingsford is at the heart of our ambition to be a top 100 European club and to deliver on our progressive modernisation strategy,” said Mr Milne. “Getting the best possible value for Pittodrie is vital. “We are also looking at share subscriptions and other mechanisms, along with a fundraising campaign. Having a single complex at Kingsford that encompasses the new stadium, football training academy and community sports hub will create a focal point for professional footballers and coaches to train and interact with the community. The purpose-built facilities will also provide a base for the significant expansion of the award-winning work of the club’s official charity partner, AFC Community Trust (AFCCT). The charity engages with more than 17,000 participants each year across 60 programmes and initiatives, with volunteers from the organisation delivering more than 5,000 hours of free community support in their spare time. The development at Kingsford will help the charity to reach even more participants of all ages and from different walks of life to deliver on social inclusion, participation in sport and healthy lifestyles across the region. AFC and AFCCT have already been engaging with local community councils and representatives from local sports groups to discuss the best use of the new facilities. Mr Milne said: “This modernisation strategy will lead the way in Scottish football and become the envy of other Scottish clubs. “We intend to provide a centre of excellence which, when combined with other sports facilities, will make the north-east a sporting powerhouse.